St. Patrick (AD 385-462) was captured and enslaved in Ireland as a youth, escaped, and finally returned as an adult to spread Christianity as a Catholic missionary. He was not Irish by birth, but was believed by some accounts to be either the son of a Roman Officer, or a British Celt. In his confession, one of the few documents known to be written by Patrick, he describes his father as "Calpornius, a deacon, son of Potitus, a priest, of the village Bannavem Taburniæ"
In legend, Patrick is given credit for driving the snakes out of Ireland. In reality, the 'snakes' may well refer to the Druids, who were discredited and finally driven underground with the coming of Christianity. Patrick is credited with establishing Christianity in Ireland, and in the following centuries it either ousted or assimilated the old, pagan beliefs. Pagan festivals and holidays were adapted into Christian holy days, and many of the local god and goddess stories converted into tales of Irish saints. The most famous example is the Celtic goddess Brigit, or Bride, who is now known in the Christian Church as St. Brigit, Ireland's premier female saint. 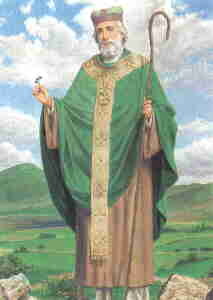 St. Patrick's birth name was Gaewyn and the estimated date of his birth was 390 A.D. in Roman Britain. At age 16 the man who would later be known as the patron saint of Ireland was kidnapped by Irish raiders and sold into slavery. He escaped slavery six years later and fled to the European mainland where he received his religious training at Catholic monastaries. He took the name Patrick upon joining the priesthood and eventually attained the rank of Bishop. It was then that Patrick set out to do missionary work in Ireland. In around 432 A.D., he arrived in Ireland and began to compete with the priests of the pagan faith for followers. St. Patrick's struggle with the pagan order of the time began during the Celtic springtime fire festival known as Beltane. The ritual commenced with the ceremonial lighting of the High King's fire, from which all the other fires in the land would be lit. According to legend, St. Patrick lit an Easter fire on a nearby hill. The High King sent nine chariots to vanquish Patrick and put out his fire. Circling counter to the sun's path, the chariots attacked, but were unable to prevail against the holy fire. Still, Patrick's work was cut out for him. In his struggle to discredit the Druid elders and gain the confidence and later the souls of the Irish population, he was (in his own words) forced to "curse their fertile lands, so that they became dreary bogs; to curse their rivers, so that they produced no fish; to curse their very kettles, so that with no amount of fire and patience could they ever be made to boil; and as a last resort, to curse the Druids themselves, so that the earth opened and swallowed them up." St. Patrick began teaching Catholicism and the Holy Trinity to the Pagans by using a three leaf clover (a plant used in many of their rituals) to represent the father, the son and the holy spirit. His efforts were successful in converting the Gaelic population to Catholicism and making Ireland a fortress for the Catholic faith. Read some of the many folk tales about St. Patrick! including the Christian Bible, in large scriptoriums. These Irish scribes later spread out across Europe, serving as conduits through which Greco-Roman and Christian culture were taught and gradually reclaimed. Work in the Irish monastery's scriptorium was an arduous, but meditative and highly esteemed labor of faith and devotion. The scribes worked through the daylight hours in the scriptorium in absolute silence, communicating their material needs in signs to an officer armarius. Each scribe worked with quill or reed pens and iron-gall ink on a folded section of vellum. Their Irish majuscule script demonstrates a sense of sublime balance and beauty; the finished capital initials are works of elaborate abstract art. When a quaternion was finished, it was sent to be illuminated. The Book of Kells is believed to be one of the masterpieces of Western art. It is comprised of the four Gospels, scribed in Latin, and was created in the scriptorium of the monastery of the Collum Cillae order about 1200 years ago. being", and others have described it as "the most beautiful book in the world." The Book of Kells was named for its home, Kells, in County Meath near Dublin. Christian beliefs of the time dictated that Bibles be made available everywhere, and the Irish Churh of that time maintained large scriptoria. Few Bibles survived the period, and large illuminated Bibles such as the Book of Kells are exceptional. The book remained at Kells throughout the Middle Ages; venerated as a relic it survived Viking plunderings, arsons, and regicides, although it was lost and recovered, and stripped of its ornamented treasure binding by thieves in 1007. The manuscript was held at Kells until 1661 when it was moved to Dublin. Today it is housed in the Trinity College Library, where it remains one of their most guarded treasures .